ANCHORAGE, Alaska — Gus Schumacher spent last winter traveling the world for ski racing, including laying down the season’s most dramatic anchor leg, non-Jessie Diggins edition, to bring the U.S. men’s relay team from fourth to a historic second at World Juniors. The then-high school senior also spent the season touring the country to plan his future in ski racing, talking with multiple NCAA coaches to discuss their programs and weigh everything from coaching philosophy to snow conditions and altitude. In the end, Schumacher chose to return back home to where it all began, Jan Buron and Alaska Winter Stars, where he prepares for what’s next from the comfort of his childhood home. 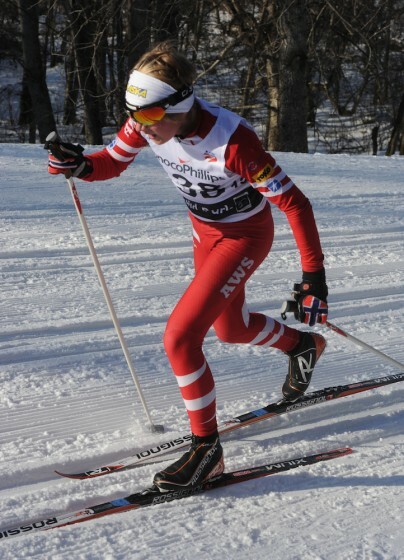 Schumacher, 18, spoke with FasterSkier in late December, shortly before leaving for U.S. Nationals in Vermont. We discussed his goals for this year’s World Juniors relay, the appeal of the familiar, and the future of American men’s skiing, among other areas. Schumacher was born Outside, in Madison, Wisconsin, while his father was finishing a medical residency. Weeks later, he moved to Alaska for good. He had a classic Anchorage kid introduction to skiing: strap-on skis in the backyard, graduating to Anchorage Junior Nordic League a few years later. Schumacher didn’t dabble in too many other sports outside of skiing, but he was an avid soccer player. The family – siblings Heidi (now 12) and Rudy (now 15), and their parents, who work as an orthopedic surgeon (father Greg, who has worked with the U.S. Ski Team) and a pediatrician (mom Amy) – spent some summers in Kenai, for cabin time and fishing, and Gus and Rudy played in a soccer league there. There was no single Saul on the road to Damascus moment when Schumacher knew he wanted to be a skier, he now recalls, so much as a more organic progression. Fast forward nine years, and Schumacher remains happily ensconced within the Winter Stars family. 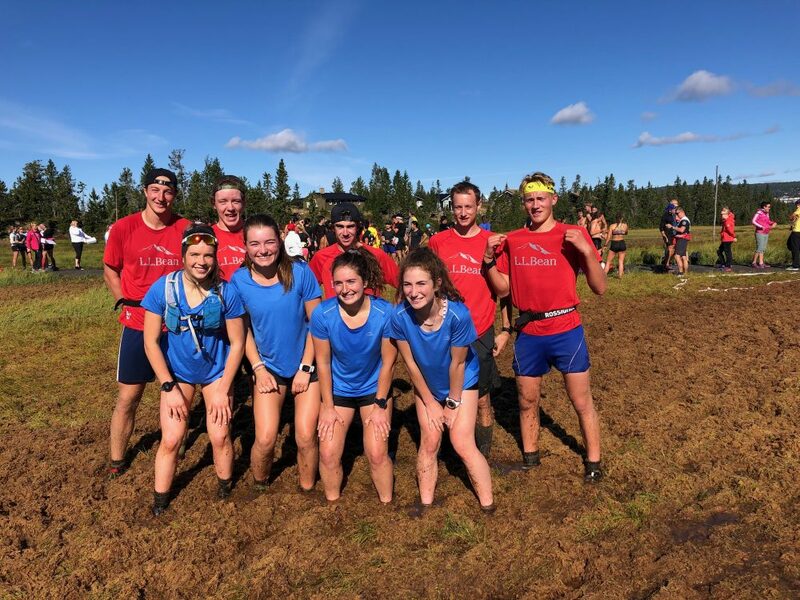 There has historically not been a strong post-juniors program at AWS, which has led many Winter Stars athletes to move to other programs, either in Alaska or the lower 48, soon after they finish high school. Tyler Kornfield and Scott Patterson are two recent examples of athletes who raced for AWS through high school, then did some NCAA racing, then moved to the APU Elite Team for continued training. Caitlin Patterson, similarly, came up with AWS, attended the University of Vermont, then joined Craftsbury Green Racing Project. 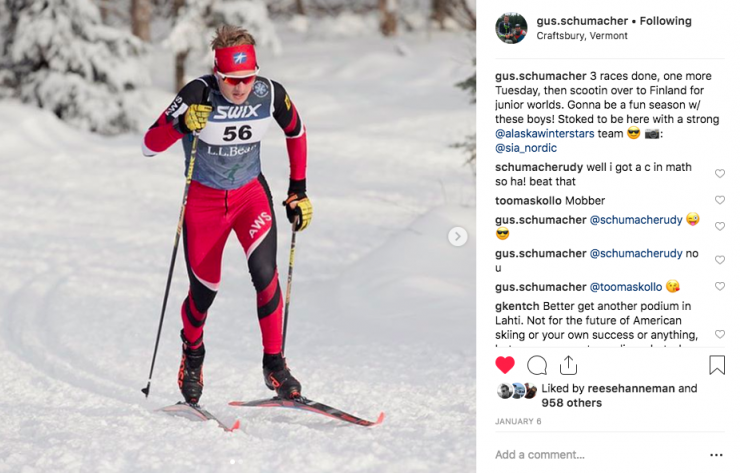 In contrast to these examples, Schumacher ultimately decided to stay with Buron and Alaska Winter Stars after he graduated from high school in May 2018. 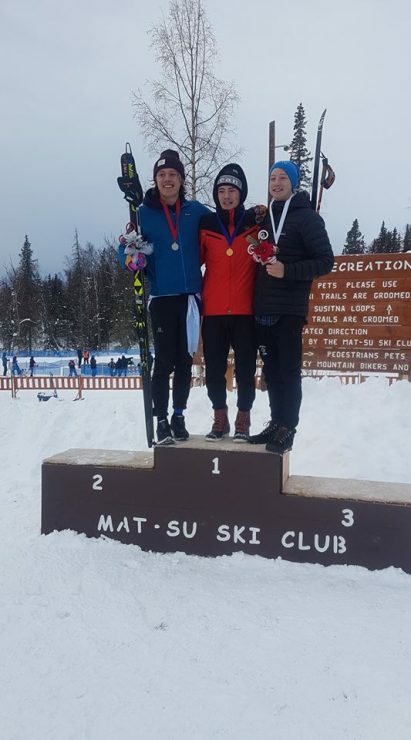 The decision is readily explained by the existence of an ongoing athlete–coach relationship stretching back nearly a decade and yielding multiple strong results; in addition to that World Juniors silver, Schumacher is also a two-time Alaska state high school ski champion. But it was very much a reasoned decision, following a lengthy and considered process. So how did he go about it? “My thought process was, I started with five or six [NCAA] schools,” Schumacher now reconstructs. “I think it has,” Schumacher muses. So who is still around? Or put another way, and perhaps more bluntly, does one of the country’s top juniors even have a training group? 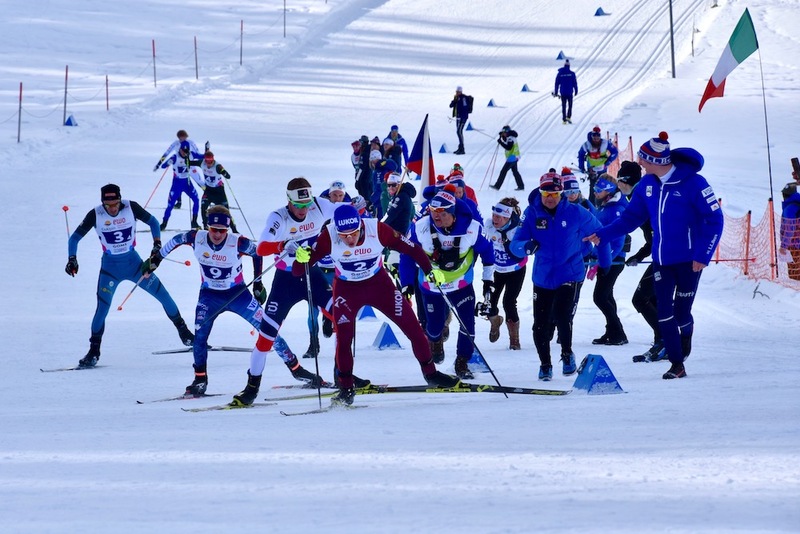 Schumacher may have charted a path that takes him away from college skiing for the time being, but he is nonetheless keeping open a place in his life for both college classes now and potential NCAA skiing down the road. For the future, Schumacher’s choice of only 11 credits, and to pay tuition for them, represents a conscious decision to preserve his potential future NCAA eligibility. He graduated very near the top of his class at Service High School, and so qualified for a partial scholarship given to Alaska high school students who are in the top 10 percent of their graduating class… but you have to be a full-time student to receive the scholarship. So let’s go back to last year’s World Juniors men’s relay for a second, featuring a relay lineup that underscored the fact that American junior cross-country skiing is fundamentally a very small world, as well as that 3-kilometer Anchorage middle school competitions are truly a breeding ground for future champions. 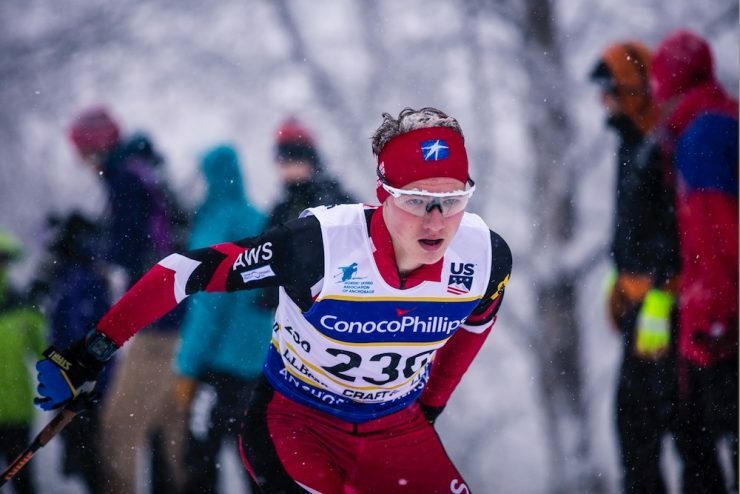 Luke Jager, an Anchorage skier who had told this site that he prepared for the race by “reminiscing about beating Gus Schumacher at the season opener middle school race in 8th grade” in February 2014, skis the scramble leg, keeping the Americans in sixth as a number of teams already start to drop off the pace. 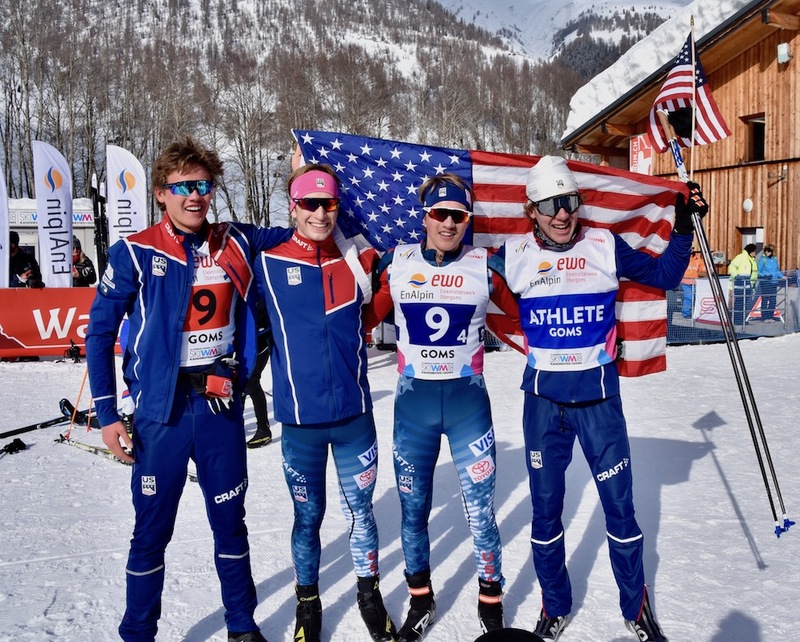 Ben Ogden, a Vermont skier of whom Jager and Schumacher once wrote, “We were so impressed that @ben.0gden could beat any of us that we decided to make him an honorary Alaskan,” brings the team up to fourth by the end of leg two. Hunter Wonders, an Anchorage skier who finished 1.7 seconds behind Jager in the sixth-grade season opener middle school race in January 2012, holds that position through leg three, handing off to Schumacher 31.3 seconds out of first and 26.2 seconds off the podium. Then he notched a perfect score in the U.S. nationals qualifying races, so that worked out. He’s in Lahti now, with the rest of the American team. Schumacher is asked what the American success in Goms last year says about the current strength of American men’s skiing. Finally, a similar theme emerges when the topic turns to the future of American men’s skiing over the next generation: Be a successful team, just like the American women. I would like, everyone would like, us to be like the girls – they’re really good.